This week I got a request for help from Sidney and company who flew to South Africa May 1st for their three-month stay. Hope you are having a grand spring day. We have just returned from Zimbabwe where we helped a girl (18 yrs old) get back into school – about 8th grade. Because they have to pay for each semester and because they are so poor, her Father could not send her this semester. She is very bright and has dreams of studying law. When we talked to the Head Master to pay, we met in a Small, crude but clean room in which a few shelves had been installed. He told us with great pride that it is their library but they have no books. He asked if we might be able to find a few people to send books…ANY books. They teach and read English. So, question is, would you have any books that you could give and send to this school? The cost to send is a little high, but if only one box could be sent that would be a God send to them. I will certainly understand if this can’t be done. We have also sent an email to ask our Church to send a box. When we return, We can get other friends to help. These people so struggle to get an education and are so desperate, they will welcome any kind of books. Thank you so much for your encouragement and help in the past. I truly appreciate you my dear friend. Would you pass this on to anyone you think might send a few books please? Of course last fall I had sorted through my personal library and donated a couple of boxes to our local library book sale. 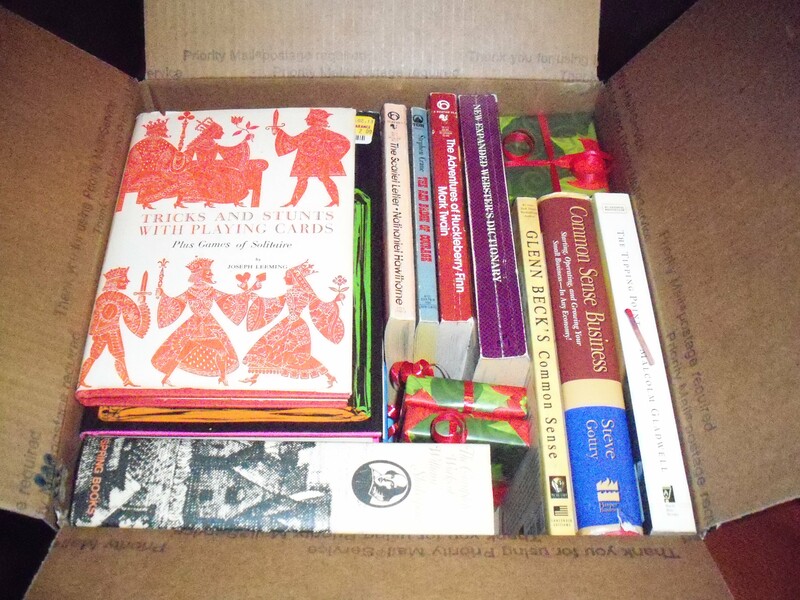 However, I did find my complete works of Shakespeare (very fine print), a paperback dictionary, a few fiction books in paperback from a high school reading assignment, a book on card tricks plus new playing cards which all landed in my send to the Head Master pile. To round out the shipment and fill a USPS flat rate box, I went to Half Price Books clearance self last night to buy a selection of hard back non-fiction books.